Nothing is more disheartening than discovering a band at a crucial juncture in their career, especially one who is seemingly going on hiatus. Sometimes real life gets in the way of rock and roll dreams. Such is the case with the Minnesota foursome The Evening Rig. After releasing Nothin’ to Hear Here last year, the band will be playing their “last foreseeable show” this Friday at Kieran’s in Minneapolis following a career move that has taken bassist Eric Reyers to Texas. Hometown aside, the comparison to The Replacements has been made before and will likely continue any time The Evening Rig is mentioned. You can’t fault vocalist/guitarist Jason Miller for sounding at times like Paul Westerberg. This is most evident on the album’s opening track, “Pulling Strings” and the ramshackle standout “Dear You” which could be mistaken for a ‘Mats song due to Miller’s Westerberg-esque phrasing and vocal range. The twin guitars of Miller and Josh Lynch provide the band with a more expansive sound, steering more towards A Blessing and a Curse-era Drive-By Truckers on “Untitled.” Anchored by Becky Hanten (drums) and Eric Reyers (bass), the piano and pedal steel sprinkled throughout Nothin’ to Hear Here warrant The Evening Rig a place in the same camp as contemporaries such as Truckstop Darlin’, Glossary and Alone at 3AM. Should Nothin’ to Hear Here be The Evening Rig’s swan song, they have left a worthy catalog of music during their seven years as a band. 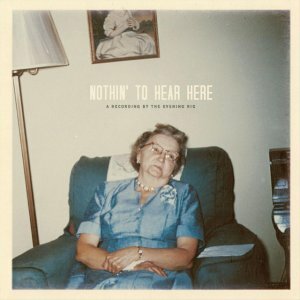 Check out Nothin’ to Hear Here as well as their earlier releases, Is Doin’ Stuff and Never Been’er. Watch The Evening Rig perform “Dear You” at First Avenue in their hometown of Minneapolis.